The Bell 206 is a family of a two-bladed, single or twin-engine helicopters, and one of the most popular light utility helicopters to be produced. Over 7,000 airframes have been built, with production running from 1967 - 2010. It was developed primarily as an observation helicopter for the U.S. Army, later being selected as the OH-58 Kiowa. It was introduced initially as a civilian model known as the JetRanger, with an improved stretched version designated the LongRanger. 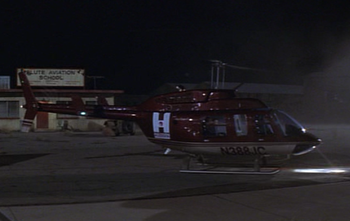 This page lists all films that feature a variation of the Bell 206. For the license-built variant, see Agusta-Bell 206. Pages in category "Bell 206"
This page was last modified on 1 February 2014, at 17:22.